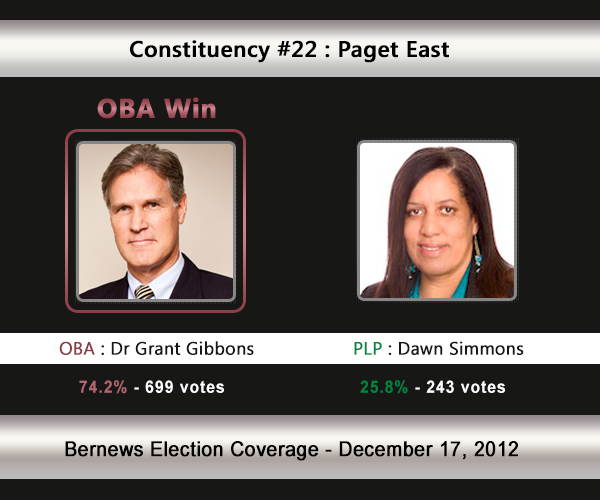 [UPDATE Dec 17: Election Results] Incumbent Dr Grant Gibbons [OBA] romped to victory against his challenger Dawn Simmons [PLP] in C#22 Paget East. Paget East will see incumbent Dr Grant Gibbons [OBA] challenged by Dawn Simmons from the PLP. Dr Gibbons has held the seat for 18 years – first winning it in a 1994 bye-election. In 2007, Dr Gibbons [under the UBP] won 77% [723-212] of the vote vs the PLP’s Davida Morris. In 2003, Dr Gibbons won with 80.63% of the vote against Delaey Robinson [PLP] who received 19.37%. 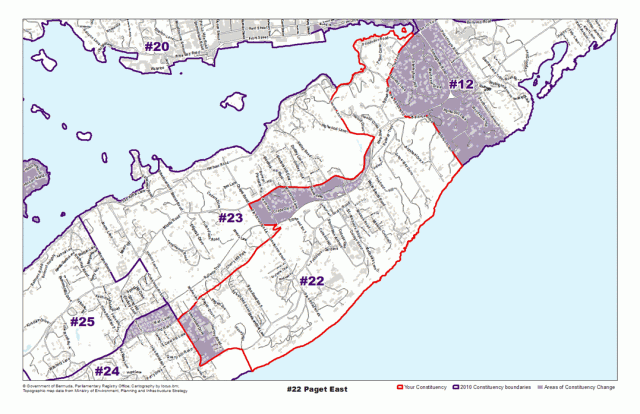 Areas the Paget East constituency compromises of, or is located by, include Ord Road, White Sands Road, Lovers Lane, Berry Hill Road, Trimingham Road, Point Finger Road, Southcourt Avenue, Harvey Road and more. Joella Dawn Simmons, the daughter of Eugene & Betty Gilbert, and one of seven Gilbert siblings was born in Paget, Bermuda and grew up in Sandys. Ms. Simmons was educated at West End Primary School in Sandys Parish, and received her secondary education at The Berkeley Institute. She then attended the Bermuda College and obtained her Certificate in Front Office Reception in 1981, and then travelled overseas to obtain her Associates Degree in Applied Science from the Berkeley School in New Jersey (1982). Her most recent educational pursuit was to attend The Women’s Campaign School at Yale University. Professionally, Ms. Simmons has worked at Department of Education, Ministry of Finance and spent 13 years at XL Capital. At XL Capital she worked in various roles in the Claims and Underwriting Department. Her ultimate position was that of an IT Trainer. Ms. Simmons has shown through years of service just how important the community is to her. This is evidenced through membership and participation in numerous community oriented organizations. She has served as PTSA President at all three institutions of which her son has attended – West End Primary, Sandys Secondary Middle School, and currently The Berkeley Institute. In addition, she has served as a Meals on Wheels volunteer since 2006. She currently attends Mount Zion A.M.E Church. On a national scale, Ms. Simmons has served on various Government Boards. She was the Chairperson of the Public Service Vehicle Licensing Board from 2008-2010, and currently is the Chairperson of the Sandys Parish Council. She is also a past member of the Consumer Affairs Board. Ms. Simmons has served the Progressive Labour Party in a number of capacities. In 2007, she was served as the Campaign Chair for the General Election. For the 2003 election campaign, she was the Co-Election Coordinator for Constituencies 32-36. She has represented the PLP at the British Labour Party Conference. Currently she serves as the Executive Officer. Ms. Simmons is the proud mother of one son, Glenn. Dr. Gibbons was born in Bermuda on July 3, 1952, the son of E. Graham and Ida Gibbons. He was educated at Saltus Grammar School in Bermuda. A graduate of Phillips Academy in Andover, Massachusetts, Dr. Gibbons received a bachelor of science degree in chemistry from Brown University in 1974. He attended Oxford University as a Rhodes Scholar from 1974 to 1976 and was awarded a master of arts in philosophy, politics and economics from that institution. Dr. Gibbons then studied organic chemistry at Harvard University, from which he received a Ph.D. in 1982. At Harvard University, Dr. Gibbons worked under Nobel Laureate, Professor R. B. Woodward. He also served as a teaching fellow from 1976 to 1981 and a research fellow from 1981 to 1982. Between 1982 and 1987, Dr. Gibbons held various management positions in marketing, planning and licensing at Squibb Corporation (now Bristol-Myers Squibb) before being appointed Director of International Licensing. He returned to Bermuda in 1987 and took up responsibilities as managing director of Gibbons Company, Ltd., and Peniston Brown Co., Ltd. He also held directorships in various Gibbons Group Companies, Perfumeries Distributors, Ltd., and the Bank of Bermuda. Currently, Dr. Gibbons is the deputy chairman of the Colonial Insurance Group of companies. He is also a director of Gibbons Group companies, and serves as a director on a number of other private and public company boards, including General Maritime Corporation (NYSE – GMR) and Syncora Holdings Ltd.
Dr. Gibbons has had an extremely active political career. In 1993, he was appointed campaign chairman for the United Bermuda Party (UBP), and managed a successful election campaign up to the October 1993 general election. In January 1994, he was appointed Senator and Minister of Management and Technology in the United Bermuda Party government led by then Premier, the Hon. Sir John Swan. In July 1994, Dr. Gibbons was elected to the House of Assembly following a by-election in the Paget East constituency and reappointed to his former portfolio. In August 1995, he was appointed Minister of Finance in the Cabinet of then Premier, the Hon. David Saul, and he served in that position until November 1998.government following the general election. . Following the Progressive Labour Party’s success in the 1998 election Dr. Gibbons continued to serve as a Member of Parliament from Paget East and as Shadow Finance Minister. He served as Chairman of the Public Accounts Committee of the Bermuda Parliament from 1998 until 2006. In October 2001, Dr. Gibbons was elected Leader of the UBPand was appointed Opposition Leader, a position he held until January 2006. He currently serves as the shadow Minister of Education. His record of public service includes membership on the Education Planning Team #2; the Bermuda College Board of Governors (1988 to 1993); the Government Employees Health Insurance Management Committee (1989); the Public Service Commission (1990 to 1992); and the Marine Resources Board (1992 to 1994). Dr. Gibbons is a former chairman of the Sales Division of the Bermuda Chamber of Commerce, a former vice president of the Chamber and a former member of the Executive Committee. He is a member of the American Chemical Society, the New York Academy of Sciences and the American Association for the Advancement of Science. He is a Trustee Emeritus of Brown University.